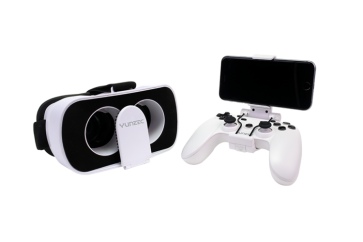 FPV headset & controller for the Breeze 4K - for more fun and virtual reality experiences. FPV Mode: With your smartphone, the included headset is fast to FPV glasses. You see exactly the same as the camera - as if you were sitting in the cockpit itself. The handy game controller is connected via Bluetooth to the smartphone and allows the pilot a control via physical joysticks and buttons. For situations where more precision is required. In normal mode, your smartphone is converted to the controller display. The Breeze FPV Controller is compatible with the Breeze Cam app for iOS (at least iOS 8.0) or Android (at least Android 4.4) devices.